* I know this sounds a bit woo-woo, but is very gentle and powerful for getting past the "busyness" of our everyday mind chatter. You mindfully utilize your body's resources as a healing system. Hakomi therapy is done within the principles of Mindfulness, Non-violence, Mind-Body integration, Unity, and Organicity. For more information go to the Hakomi Institute, with whom I completed a two-year professional training for this method. 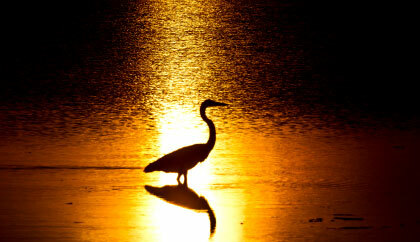 One the Institute's favorite image is of a heron, standing in the water. Often, when I explain the method, I call it "going fishing" inside of yourself.